Holding on to an Oregon “secret” for a year and a half has been difficult, as ongoing games have confirmed the accuracy of the previously “undisclosed.” This game against the Cougars revealed TWO new Oregon strategies within the offense that now render the old secrets null and void, thus we can now delight in learning about them, and how they will impact our upcoming big games against UCLA and Stanford. I don’t know what is more fun — revealing the secrets or discovering the new strategies! 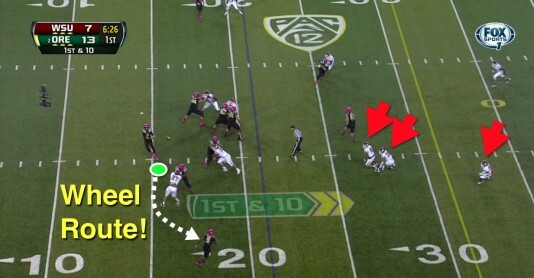 First let’s take a look at a play we love in the Oregon arsenal, the Wheel Route. 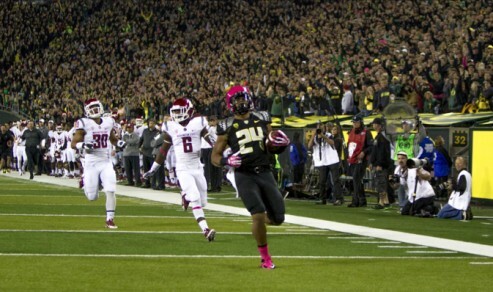 A RB coming out of the backfield usually carries it out and LaMichael James ran one for an 80-yard touchdown against the Cougs in 2010. On Saturday we see it executed beautifully as Byron Marshall comes out of the backfield to catch the ball for a huge gain. 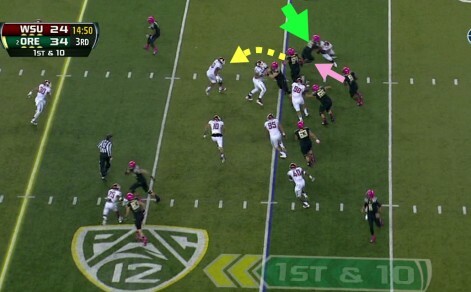 Note the red arrows (above), as the WSU defenders are badly out of position. 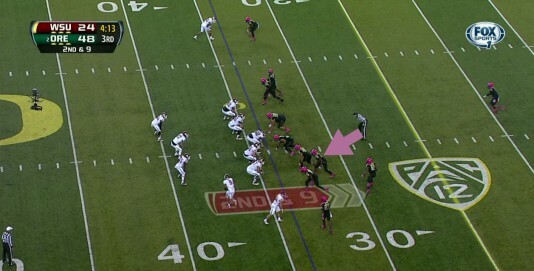 In the screen shot above — we see the pink arrow on LB Derrek Malone, as he is crowding the LOS and threatening to blitz. If he does, then the Cougars know that a RB would be unguarded coming out of the backfield for a pass. The running back (white-dotted arrow, above) is taking off downfield, while Malone has bypassed the wash of players working on getting open. Derrick knows where the pass could be and is sprinting to that spot. 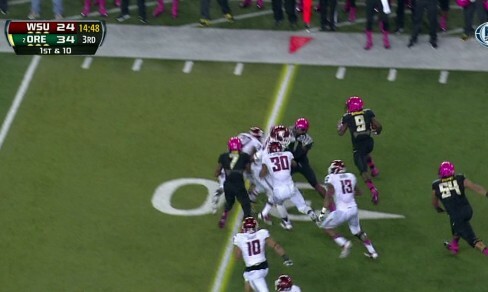 Malone goes up (above) to bring in the ball, as it is headed right to the WSU player going down the sideline. 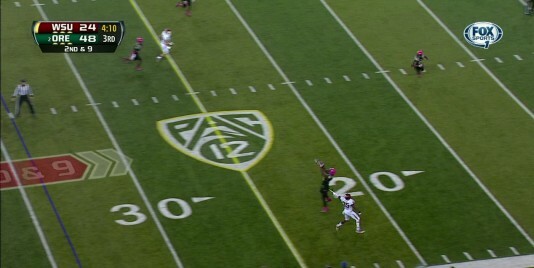 Oregon’s Wheel Route play went better than the Cougars’! This angle (above) shows you just how open this play was and how Malone made a huge interception for the team! Our new prototype LB has to be fast and able to cover well, and this is an example of the new profile of LB that Oregon is recruiting and why! 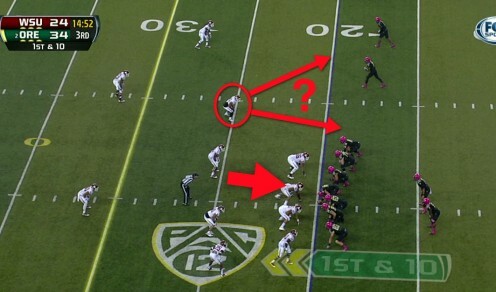 One of the secrets from the past is how sometimes Oregon COULD Zone Read the defender on the side the play is going to, (play-side) but it was rare, and the last time we used it extensively in a game was the Civil War of 2010. Imagine my surprise to see us run it on a play that everyone is familiar with! Fans know about the long run Thomas Tyner got a touchdown on, and everyone saw in the replay how Keanon Lowe made a fantastic block to nail two defenders to spring him. What no one else noticed is that it was a true PLAY-SIDE Zone Read! 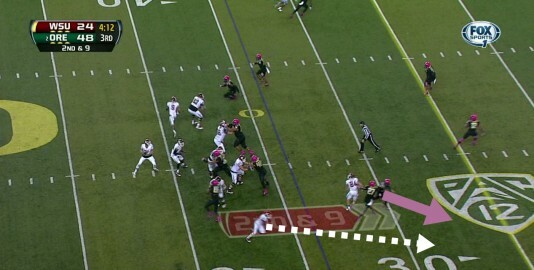 Above we see the beginning of the play as offensive linemen are blocking OZR style to the right, (green arrows) and even the left tackle, Tyler Johnstone, is stepping that direction (pink arrow, above). 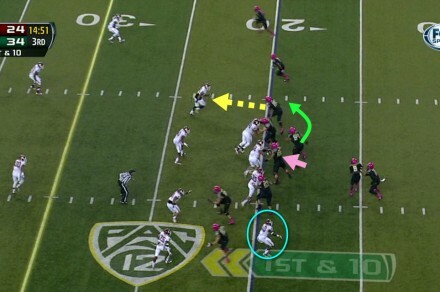 Oregon ran Outside Zone Read blocking to the right (above) and the usual placement of the RB and QB is reversed. In this case we see how the defender (in the light blue circle) being read is “sitting,” thus the read is to hand off to the RB. What if the defender decided to chase the RB? 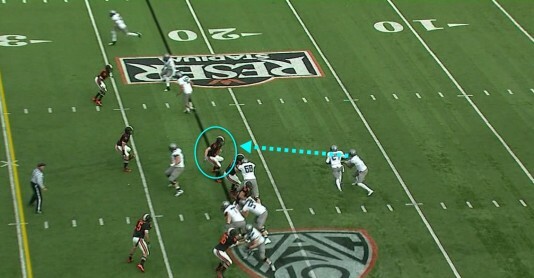 Then Marcus Mariota could pull the ball and follow the OZR blocking to his right! He would even have the option of running straight ahead and following the blocks on the LBs by the left tackle and guard. 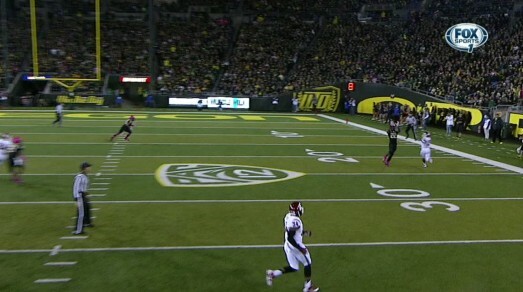 Thomas Tyner TD . . .
Everyone knows the final result of that play with the touchdown, but how many know it was an unusual Zone Read play? This style of Zone Reading is common for many teams (Auburn did it as a staple in ’10) but not for Oregon, as the Ducks usually Zone Read the backside defender. Why would we do this? Was this a twist to mess up the Cougars, or something to make Bruin and Cardinal coaches study and prepare for? I noted that we ran the playside Zone Read (above) near the end of Darron Thomas’s first season quarterbacking the team. Could this be a part of the progression that HC Mark Helfrich and OC Scott Frost take a QB through as they learn the finer points of Zone Reading? It is interesting to ponder as to whether it is strategy to mess up another team, or something reserved for more experienced Zone Reading QBs. 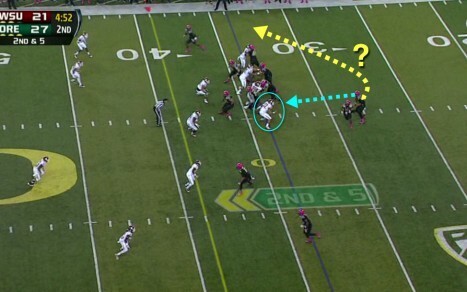 A secret that the “Grizzled Ol’ Coach” (GOC) had shared with me during the 2011 season is how Oregon would NOT run a Sweep Read against an odd front – when a nose tackle was head-up to Oregon’s center. We would lament how we are playing a team with a 3-4 defense on a particular week and thus would not see one of our favorite plays. Earlier this season, he reminded me how Virginia plays an “even” front, (no nose tackle) and thus we would get to see some Sweep Read plays in action — and he was correct, as we had some legendary Sweep Read plays in that game. It is a policy of mine to NOT point out anything unless it was drop-dead obvious to other coaches, and while the GOC saw it . . . I could not be certain that other opposing coaches noted it, hence my observance of never mentioning it. That has now changed with what occurred in the game against the Cougars! Look at the screen shot above, and note that the red arrow is on a nose tackle that is directly in front of our center — an odd front. Yet the outside linebacker is quite a ways outside instead of being on the LOS or close to it. Is he positioned to both help with the Bubble Screen and yet be able to come up for run support? Interesting! I’m hopping out of my chair as I see a clear Zone Read of a backside DE (light blue circle, above) and Hroniss Grasu is taking on the NT (pink arrow). Whoa, Doggies! We have Hamani Stevens PULLING while the TE (Pharaoh Brown) is going out to engage the OLB of WSU? It is a revised Sweep Read version, with pulling one offensive lineman instead of two! To the left of Brown is Cam Hunt, blocking down on the defensive tackle and sealing the edge. Wow! Is this a screen shot of beauty for an offensive lineman or what? 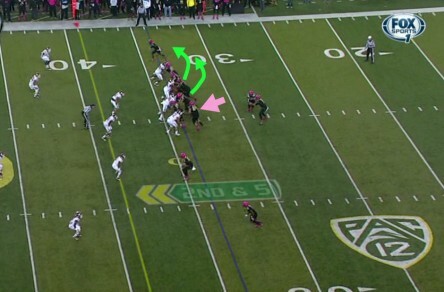 We see Brown driving the OLB out of play completely (green arrow, above), while Stevens is turning the corner and taking aim on the MLB, and Marshall (pink arrow) is skittering along the wonderful lane created. Marshall (No. 9, above) has exploded through the secondary and is able to gallop down the sidelines due to tremendous blocks by Lowe and Josh Huff. We just did a Sweep Read on an Odd front for big yardage! My feathered friends — I cannot be certain, as this is conjecture on my part, and I welcome the tons of coaches who read this to offer their thoughts. The GOC (Coach Mike Morris) mentioned how a usual 3-4 defense with a five-man front may have difficulty slowing our passing game, and that has great relevance for our upcoming games against UCLA and Stanford who BOTH run 3-4 and five-man fronts. Will we see Sweep Reads against a five-man front? 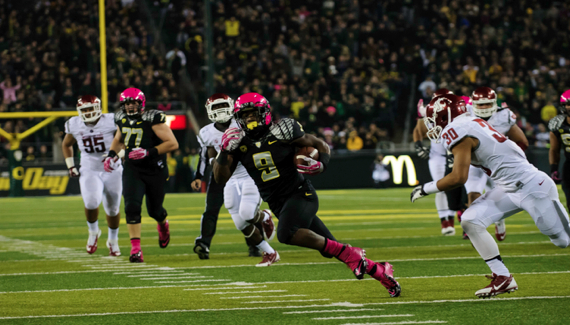 Will our opponents implement the “new” Odd-man front Oregon faced from the Cougars? This is going to be GREAT FUN to see!